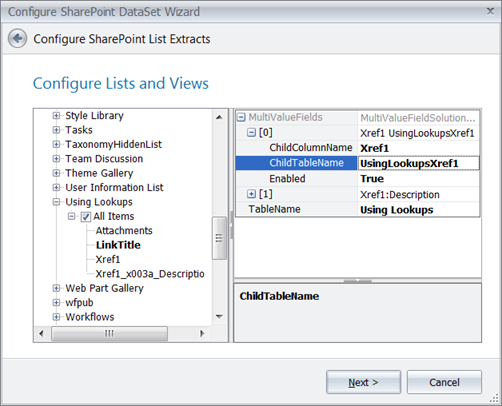 Data stored in SharePoint lists can be easily made available to QTAssistant through SharePoint DataSets. 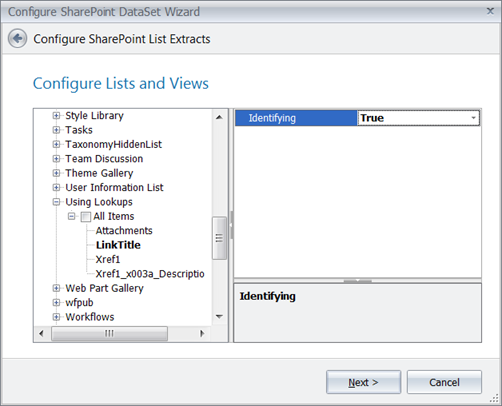 This functionality allows the use of SharePoint as a repository of data to use it as reference and test data in QTAssistant. Typical uses include integration with DataSet-SQL, Test Workspaces, Combinatorial Test Modeling, Query XSD Analysis and Report Designer. 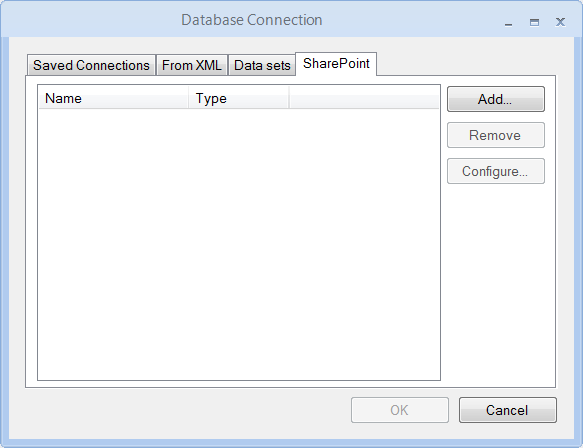 The implementation supports disconnected mode by caching SharePoint data in local DataSets. 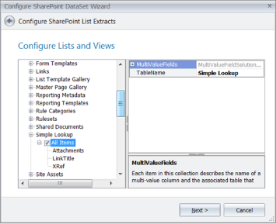 Multiple lists, from the same or different SharePoint sites can be bundled together in a SharePoint DataSet. Lists with multiple value columns are supported; lookup columns are used to infer relationships between the generated data tables. 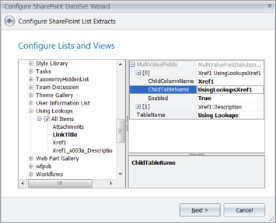 A SharePoint DataSet is an XML file which stores connectivity information, selected lists and view names, along with any solutions entered by the user concerning the handling of multiple value columns. 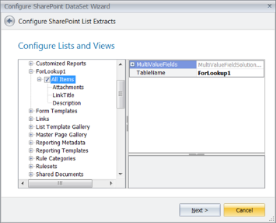 Some QTAssistant components can directly use this file and create a snapshot of SharePoint data on demand. 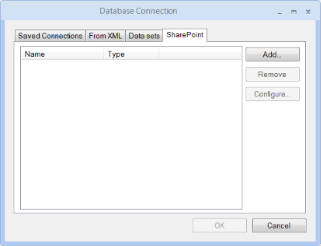 Captured data can be exported in standard .NET DataSet files for reference by other .NET components. QTAssistant automation API allows the user to easily integrate this functionality in custom workflows. 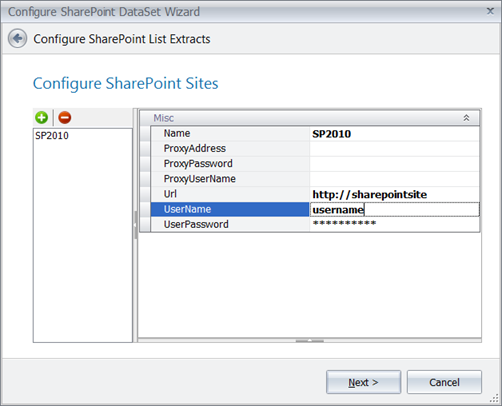 The setup consists of three lists on a SharePoint 2010 installation, loaded with dummy data. 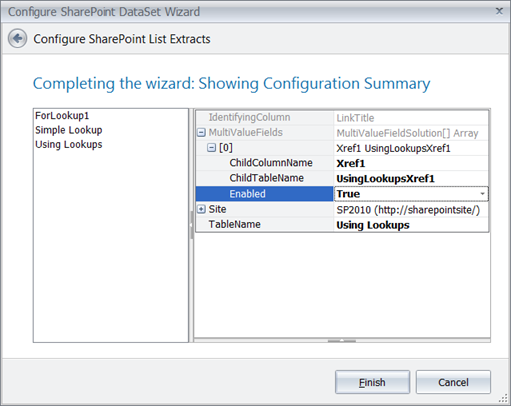 The command invokes a configuration wizard. First page collects connectivity information. 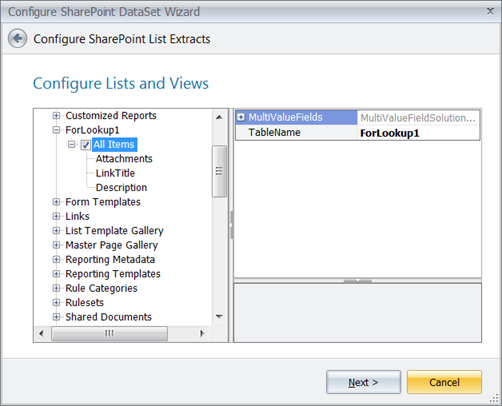 Second page is used to select and configure the lists to load. Click the checkbox beside the view you wish to reference. Select only one view per list. Paging is not currently supported. 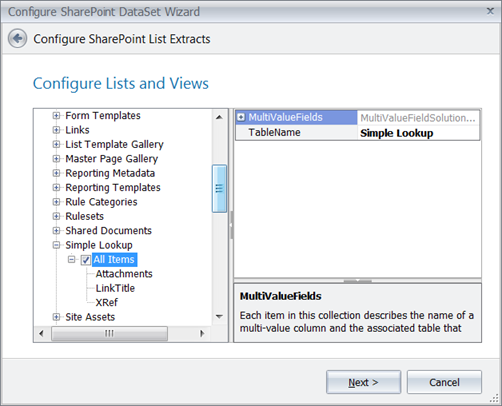 As a workaround, configure the view to return the whole list of rows. Select the next view/list. Lists without multiple values columns, or that the user is not interested in normalizing, require no additional configuration other then selecting the view. 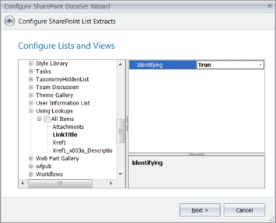 To "normalize" a list with a multivalue column, the user must select an "identifying" column - a columns that is mandatory, and has a unique constraint placed on it. Fill the name of the new table to hold the 1-to-many relationship. The "child" entity is the new table. Setting up a multivalue column for denormalization. The final page of the wizard allows for checking of the information entered. 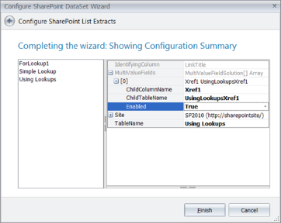 Press finish to create and save the SharePoint DataSet on the disk. The generated SharePoint DataSet can be used with DataSet-SQL CREATE DATABASE to extract the data, or directly by Query Designer.